Ready for the release: Student group with community member Jacqueline Spadaccini, second from right, and Michele, of Forgotten Cats. Students learn the proper release method. The last of the colony to go free. 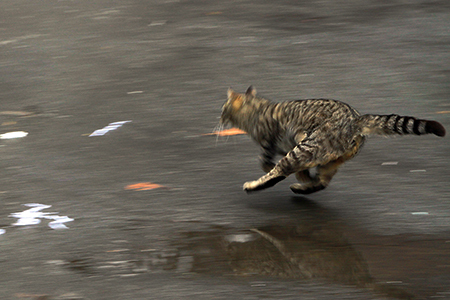 West Windsor, N.J. – If you have ever had a problem with feral cats in your neighborhood, you know they do not go away. In fact, they multiply quickly in just a few years. That has been the situation at Mercer County Community College (MCCC), where a few cats about a decade ago have multiplied to numerous colonies. The cats have roamed freely on the edges of the West Windsor Campus and also began venturing into Mercer County Park, whose boundary adjoins the college’s West Windsor Campus. As a regular walker at the park, local resident Jacqueline Spadaccini noticed these newcomers last fall and was advised by a fellow walker that the cats were most likely coming from the college. That was enough for Spadaccini, a true cat lover, to begin considering a plan to help the feral felines. There was an effort several years ago to address MCCC’s cat population. But clearly, more cats went on to deliver kittens and continued the growth of the colonies. The next step was contacting an organization whose mission is to deal with feral cats in a humane way that breaks the reproduction cycle. Enter “Forgotten Cats,” based in Willow Grove, Pa. The group carries out a program known as Trap, Neuter, Release (TNR), a practice that takes place all over the country with good results. “We work to maintain the colony in the most healthy, positive way. Our goal is to reduce population growth,” says a Forgotten Cats representative who is known simply as Michele The Cat Trapper. 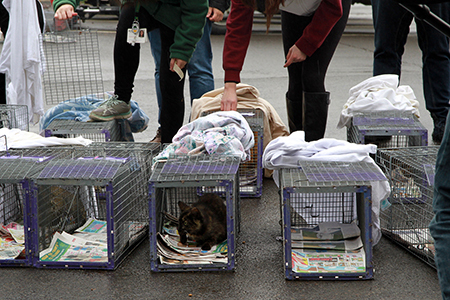 She notes that spring is “kitten season,” so time was of the essence to trap and care for MCCC’s cats – especially the ones about to bear kittens. According to Michele, Forgotten Cats provides the care and attention the felines have been lacking in the wild. All cats are neutered and vaccinated for illnesses such as distemper and rabies. They are dewormed and given flea treatments if necessary. If they are long-haired with matted coats, they are shaved for comfort. “We also look for wounds, ticks, and lice, and treat as necessary,” Michele said. The veterinarian clips each cat’s ear slightly to indicate he or she has been treated, a standard TNR practice nationally. Once a project starts, it goes around the clock until the job is complete, usually ranging from five to ten days, depending on the numbers. 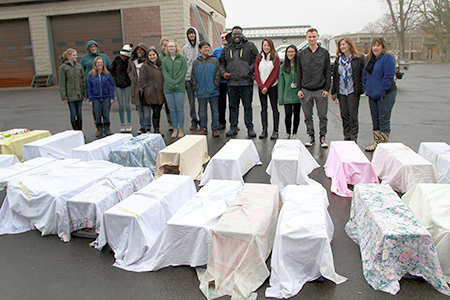 The immediacy and urgency of the program at Mercer was very much in evidence on March 27, when students checking on the traps found a litter of four newborn kittens under a blanket in one of the college’s auxiliary greenhouses. 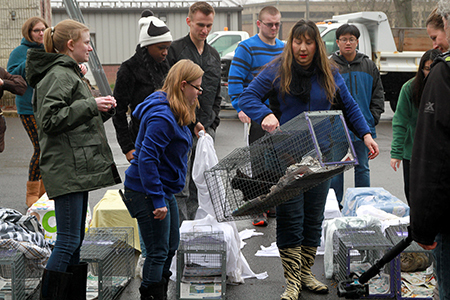 Finally, the cats were ready to be released back to the West Windsor Campus. 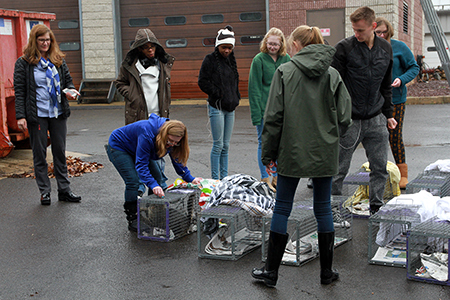 The chilly, wet weather on April 3 was no obstacle as students assisted Michele and Spadaccini in setting the cats free in their home territory. See the coverage in the Trenton Times here. Mercer’s SGA President, Jennifer Eng, says that students are pleased to be part of an initiative that has come to fruition during their time as MCCC students. They are already in discussion about establishing an Animal Lovers Club, a group that would be dedicated to helping support the cats that are returned to campus to live out their lives. Spadaccini concurs that the experience has been very rewarding. “I am grateful that everyone got together to find a happy solution,” she said, noting that during the project she met Horticulture instructor Ron Rabideau, also a cat lover. Spadaccini, a master gardener, has decided to return to school at Mercer this fall to take Horticulture classes and will get to see the cats she helped as they return to a better life on campus.